Although Windows 10 is fully GUI operating system, it still keep the best command of the command prompt. It still very useful for many people to do a specific task. Run command prompt under administrator privilege for the best result. Click search button, type command prompt (don't press enter key yet), right click and choose run as administrator. 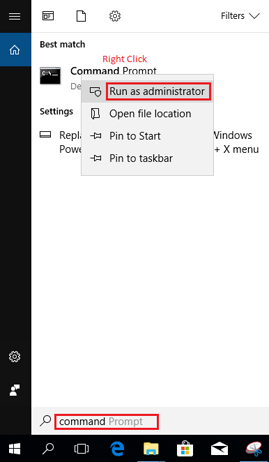 Below is a complete list of command prompt in Windows 10 and some example of usage if any. Sets properties in boot database to control boot loading. Displays or configures Disk Partition properties. Displays current device driver status and properties. Displays or configures the file system properties. Displays Group Policy information for machine or user. Display, modify, backup, or restore ACLs for files and directories. Displays files opened by remote users for a file share. Displays or configures services (background processes). Allows proper local or remote shutdown of machine. Displays machine specific properties and configuration. Displays all currently running tasks including services. Kill or stop a running process or application. Displays WMI information inside interactive command shell. If you need list of command prompt in Windows XP, click here. If you need a list of command prompt in WIndows 7 click here.